My concertina would originally have had solid Indian rosewood ends with a fancy fretwork pattern cut out of them (to let the sound out). At some point they have been lost (they probably split and fell apart - apparently quite a common fault) and somebody has replaced them with aluminium sheets with holes drilled in them. Although functional, they are far from attractive, so I want to make a new pair of wooden ends. The big question was what kind of wood to make them from? A chap who has restored several concertinas, including making new ends, advised me that it's a good idea to use a high-quality hardwood laminate (several thin layers of wood glued together with the grain of alternate layers running at right angles to each other) rather than solid wood, to avoid the problem of them potentially splitting again in the future. I've seen a photo of a very fancy original antique Lachenal concertina that has laminated ends, so it seems the idea has historical precedence too. I suspect they didn't routinely use laminates for the ends because it's a much more labour-intensive and expensive process. 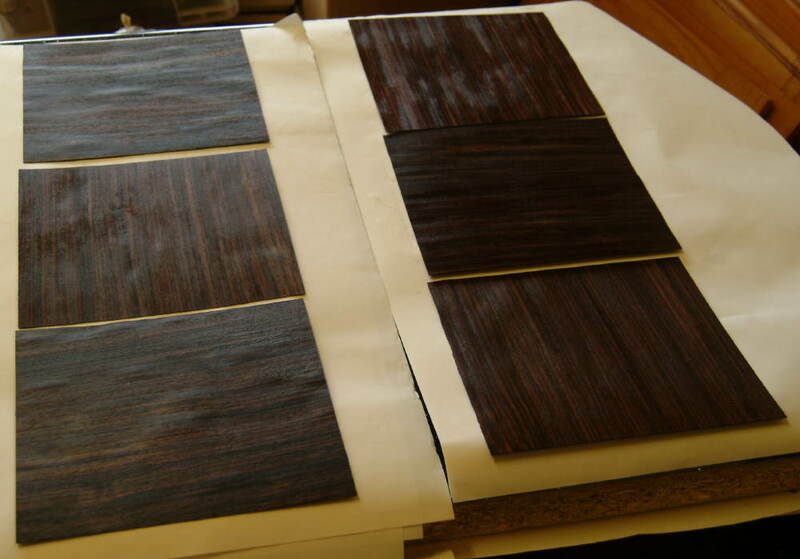 The next big question was what wood to make the laminate from. One option would have been to make all but one layer from something fairly cheap and use something fancy (e.g. a pretty burr) for the visible outer veneer. After much searching and calculating and debating (with myself) I opted to get a long strip of Indian rosewood and use that for every layer. That way the end result should look fairly close to the original, providing you don't peer too closely at the edges. I could in theory veneer the edges too, though the shape might make that rather tricky and it would still be possible to see the laminations on the inner edges of the fretwork piercings. 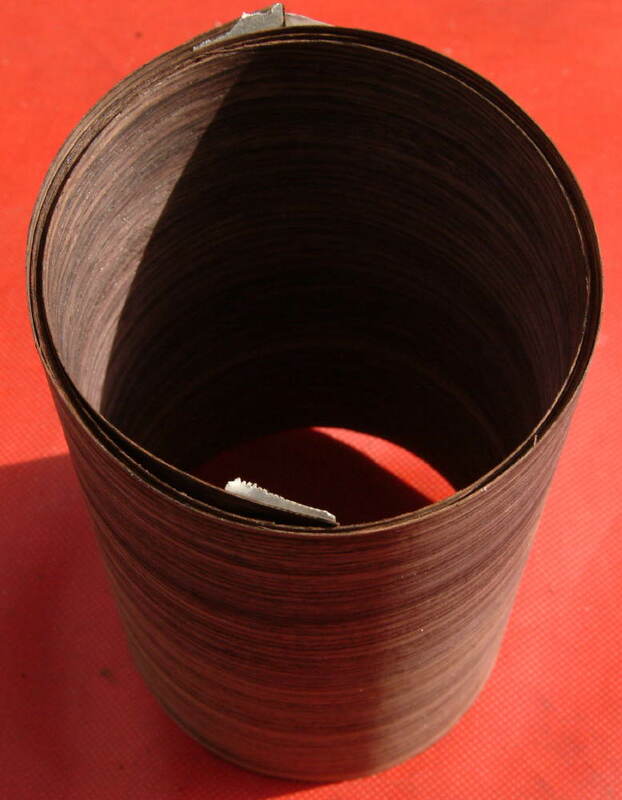 Here's what the frighteningly expensive rosewood veneer looked like when it arrived, rolled up into a tight cylinder. After unrolling it, with the concertina in shot to show the scale. The first stage of making the laminate is to cut the veneer into rectangles (six per board), half of them with the grain running in the opposite direction, and then flatten them so that the pieces will glue together nicely and I'll hopefully end up with a flat board in the end. Incidentally I tried cutting the veneer with sharp scissors but it was causing it to split along the grain so I reverted to using a very sharp knife and steel ruler. I'm using a veneer softening liquid which is a mixture of water, alcohol (meths), glycerine and hide glue. I warmed it very slightly to avoid the glue thickening. It has an 'exciting' smell! You soak the veneer in it until it goes floppy, then dry the pieces for a day or two between layers of scrap paper (replaced every few hours) and flat weighted boards (I'm using offcuts of kitchen worktop). I tried the technique and potion out first on a small piece of relatively cheap sycamore veneer that I'll be using to put decorative inlays into the corners. Time spent so far on cutting and flattening the veneers: about 3 hours. You would see the edge of the edging veneer around the top surface, but it would be side-grain so arguably less objectionable than end-grain. I'm probably not going to attempt it though, because of the difficulty of making the edging strip curve around the rounded-off corner. It probably won't look too bad anyway - it's not like I'm using an ordinary plywood that has low-density filler layers in it. I suppose the other way of looking at it is that leaving the edges of the laminate visible shows you have nothing to hide - it's rosewood all the way through, even if it is made up of six layers. An expert would be able to see the extra effort put in to produce something that is much stronger and more stable than the original. Unlike the sides of the action box, which appear to be made of a cheaper wood (probably mahogany) with a rosewood veneer.